A4-G1-1, Ground Floor Solaris Dutamas, No. 1, Jalan Dutamas 1, 50480 Kuala Lumpur. Part of the Edo Ichi Japanese Restaurant chain. Enter Publika mall from the West Gate. Walk straight until about middle of the mall, turn right and go down 2 floors by escalator. 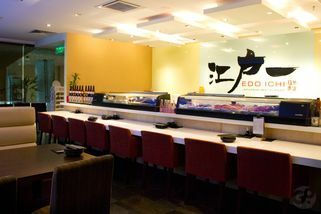 Edo Ichi is on your left, near the side entrance to Publika mall. 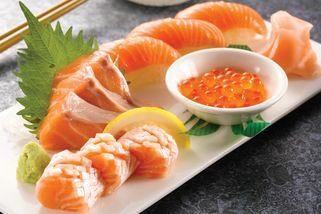 Edo Ichi adopts a concept of Japanese cuisine similar to Japan which centers around the four seasons and the unique food items each season brings. Besides their standard menu, they also have a seasonal menu which features food procured within specific seasons and time in Japan. Upon request and booking, Edo Ichi can also procure specific seasonal items (limited to within the season itself) and personalized made-to-order dishes for customers. 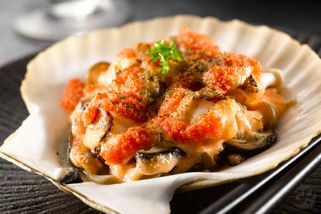 For those looking for more standard Japanese fare, Edo Ichi’s menu covers most of the usual items like sushi, sashimi, teppanyaki, set meals and more. 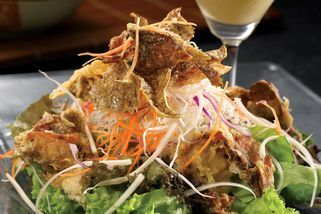 This outlet in Publika, Solaris Dutamas is ideal for dates and anniversaries, with tables separated by cubicles for a little bit of peace and quiet, private rooms, and the stars of the restaurant are the seats beside the indoor aquarium, providing a serene ambience perfect for a romantic dinner. "nice food but blur waitresses -_-"
Im okay with this restaurant except the waitresses. that day i asked for GoMakan mug coz i saw it in this website that they r participate in GoMakan mug campaign, so i tried to ask a mug to the waitress, and the waitress didnt say anything just nod her head and go. i thought she understand..but after hours, she never come again. so i tried to ask again to a different waitress. she leave me and looks like she understand. but after few minutes, she come again bring another waiter. so i explain again about the campaign. and that guy also go again and this time he grab his manager to talk with us. zzzz i explain it again to the manager. after tired explaining, finally they gv me a GoMakan mug. but it's okay lah, coz i think it just funny..
btw, the food in here r nice and clean. i ordered sushi to wakatori set, it's 48rm. it comes with ocha, coz there's no ocha charge on my bill. and i think it's not so expensive for japanese cuisine. "I ordered the wrong thing"
After reading the reviews, I ventured there with a craving in mind - which is usually impossible to meet outside of Japan (what was I thinking?).. 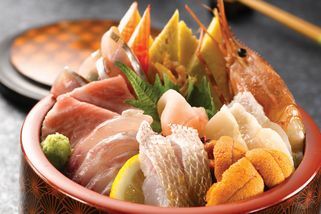 I was hoping to find a restaurant that serves maguro yamakake don, the original shop Robata Daisaku that served this in KL no longer exists. Anyway, I ordered myself a tekka don, a regular tuna on rice meal. It was very bad. The tune slices were tough and cold, on the tasteless side - it felt like food prop. I tried to douse my bad decision with lots of wasabi and shoyu - no help. It is a busy restaurant, I will go back and give it a proper try. Just don't ever order the tekka don, and I am probably deterred from ordering tuna sashimi too. Service was quite prompt as I sat by the sashimi counter. Someone was talking quite loudly in the same room, I take note that it is not a good place for any formal discussions over lunch. Car drop off is easy and the outlet is disable-friendly. "AWESOME food, ambience! but not services..too bad"
1. I finish all the food and taste Soooo..delicious! Except for services, the guy in suits[maybe manager] look arrogant..and didn't treat customer nicely..And because this restaurant is listed in mug campaign, i'm really looking foward to get a mug..but it takes 2 waiter and the manager itself..(total time that i wasted to get gomakan mug is about half an hour i think?) .. This is a nice place to hang out over some sake, and plenty of good food. Almost everything on the menu is good. 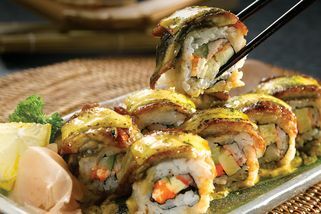 I especially love the unique Rice Pizza which comes with Unagi (eel) and Salmon slices, and just enough Mayonnaise. The Rice base is quite amazing, it's basically sushi rice pressed together, coated in panko breadcrumbs and deep fried. Addictive. Service here is hard to fault, the staff is polite, attentive, and professional. The regulars here often get special treatment too. "A really nice place for a date"
The seats beside the aquarium are just beautiful. I recommend the Asari Wine Mushi. 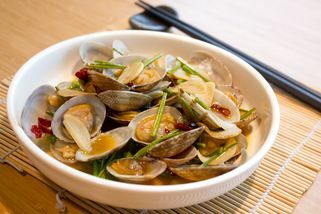 It was very aromatic and even a person who dislikes clams like me can't stop eating it!